Au Solutions aims to provide medical professionals with the technologies to revolutionize the standard of care for patients suffering from medical events, reducing mortality and improving patient’s quality of life. Triaging and treating gunshot wounds and other invasive chest wounds is labor-intensive, risky, and fraught with potential complications. Au Solutions is developing the Pulmonary Assist Device (PAD), to alleviate the effects of invasive chest wounds at the site of injury. The key target markets are the military, emergency medical services, and hospital and ambulance service suppliers. 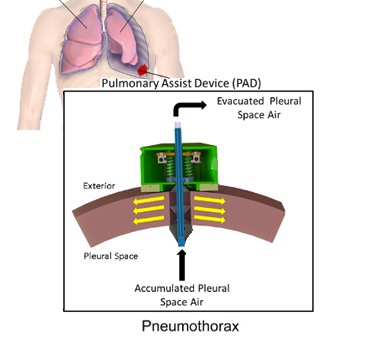 The Pulmonary Assist Device (PAD) is an innovative new product meant to treat thoracic out in the field. Reducing mortality and hospital stays vastly improving the current standard of care.